Chances to Change • View topic - Practice don’t Preach Theory U in 7 Breaths! 4th Breath. Post subject: Practice don’t Preach Theory U in 7 Breaths! 4th Breath. We meet and live the “groan zone” in our Guest House, an inevitable step to allow the “letting-go” of what no longer serves us and arrive at the bottom of the U. What is the “groan zone”? Are you able to recognize the groan zones in your life? The “groan zone” is a term introduced for the first time by Sam Kaner and his colleagues in 1998. They define the “groan zone” as a natural period of confusion arising in a meeting when difficult issues emerge whilst in the process of what they call participatory decision-making. We define “groan zone” as a phase where we can experience stuckness, resistance, blocked energy, confusion. We often have a strong desire to bypass and come to premature conclusions and shift to the right side of the U. 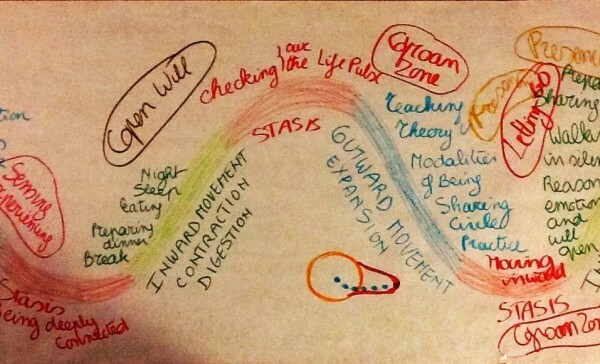 As we attempt to breathe life into Theory U and emphasize its purpose to be a Way of Being – reconnecting to the more authentic and higher aspects of ourselves – we need awareness of the “groan zone”. You are reading the fifth article in a series of nine. The series aims to assist you to dance Theory U. The use of “breaths” is a metaphor for the components of the Life Pulse. The Life Pulse is a cosmic principle governing all of life in the Universe. The Life Pulse consists of sequential phases of contraction, stasis, expansion, stasis. The first article invites you into our Guest House and creates a safe container. The second article shape-shifts “downloading” into a tool to gain more of Self. A listening space arises. The third article breathes life into the opening of our State of Being reason. The more of Self that is available establishes the “observing” and “curious asking” quality. The process continues with the opening of our State of Being emotion in the fourth article and we add “experiencing” to our toolbox. We experience in our physical body what we do with what happens to us and we sense through the group being. The diagram below shows us where we are. This article covers the 4th of our 7 breaths. We prepare ourselves to open our will and to learn about the importance of delving deep inside of ourselves. This deep dive is necessary in order to discern and live the “groan zone”. The learning cannot happen through a teaching, it has to unfold through the magic of this fascinating triad of “witnessing, asking, experiencing”. 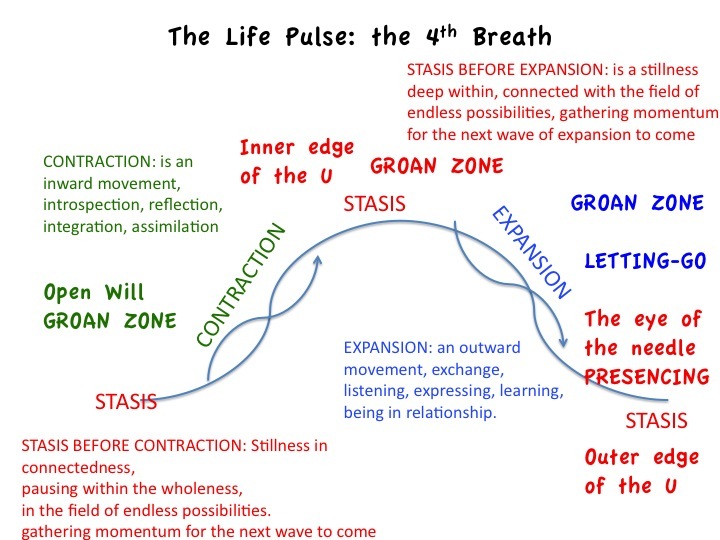 The 4th Breath is, as all the other breaths in our series, a Life Pulse composed of an inward movement of contraction (green on the picture), followed by a moment of stasis (red on the picture and located at the inner edge of the U), gently extending in an outward movement of expansion (blue) and back into stasis (again red and now at the outer edge of the U). The graphic representation reveals how the “groan zone” occupies and affects this whole breath. Only at the very end of this breath does the “letting-go” happen. We move through the eye of the needle and dive into “presencing”. The drawing below demonstrates where this Breath is in our dance through Theory U. We move inward, and gently and lovingly prepare ourselves to open our State of Being will. The symbolic representation gives us an overview of our constellation. Our soul incarnates on Earth by engaging with a body-mind. 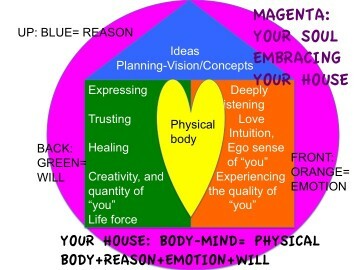 This body-mind is our house and consists of a physical body, which generates an energy field. This energy field represents our personality and can be divided into three different States of Being: reason (the upper part), emotion (the front part) and will (the back part). To learn more about our fascinating human potential, please read the series of articles on Physics and Reality. Opening of the State of Being will creates space at the back of our energy field. Chakras are energy vortices in our energy field, they are connected to areas in our physical body where there is a great deal of neural activity. Each chakra has a particular psychological area of interest. This State of Being, will, is reached by opening the back chakras from the fifth down to the second chakra and then to the first chakra. The back of the fifth chakra stands for how we express ourselves in the world, the back of the fourth chakra holds our capacity for trust, the back of the third chakra is our ability to heal ourselves, the back of the second chakra encompasses our creativity and quantity of Self. The first chakra is the home of our life force. The step by step opening of our will centres is for me the “groan zone”. It requires courage to be vulnerable and to face our struggles and doubts, confusion and resistance. The gift of opening our will is the access it gives us to the intelligence of our hands, our power from within, our creativity and our capacity to be undefended. A detail of the drawing of Dancing Theory U shows our body-mind as an orange circle and our soul as a blue dot, which is moving from the centre of our body-mind to the edge and crosses the edge. A red wave tries to keep the soul movement from happening. This wave reveals the resistance. As a host you completely participate in the “groan zone”, if you are able to show your vulnerability, you will inevitably meet your own resistance and create abilities to grow and gain more of you and you will be better able to hold space for the uneasiness, the unknown, for the boiling potential, for the uncertainty of your group. The point of stasis is crucial at this moment in our 4th Breath. This is the moment where you shift the attention from deep within each participant outwards while you are also experiencing the “groan zone” with the group. 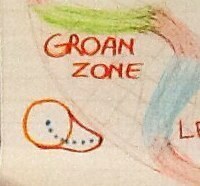 The participants gather momentum in order to live the “groan zone”. A ritual or a meditation is often very helpful in bringing awareness to this moment. As a host you are holding a listening space, flavoured with curious asking and experiencing, in an atmosphere of witnessing. 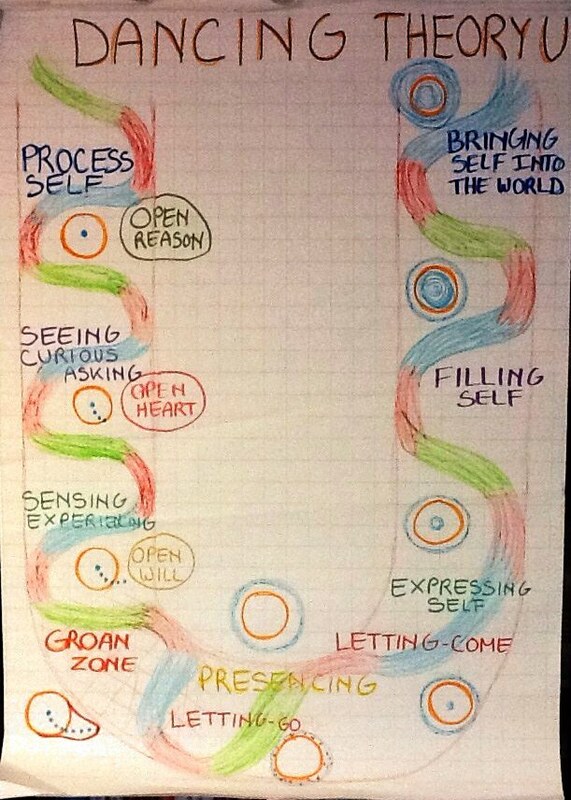 Time to introduce this wonderful tool - “witnessing, asking, experiencing” – in more in depth. The “asking” is a dance between the inner process and the external event that is happening to us or around us. It is a curiosity about what is here now with an opening of our State of Being reason. The asking prompts the “experiencing” of what is happening in the body as we open our State of Being emotion. Once we are “experiencing” the sensations in our body, we are then able to acknowledge where we are through impartially “witnessing” what is happening now. There is no judgment; we simply notice what is happening. We do not do anything; we just allow whatever happens to unfold. This is the true opening of our State of Being will. You can read more about this magic triad in the series: Why Everything that Happens Affects Everything. We continue with an outward movement still in the “groan zone”. Most of the participants don’t like it; they experience resistance and stuckness. We try to speak the “groan zone” into being. It is by exchanging and supporting each other that each participant will be able to really grasp this concept of “groan zone”. We realize that the resistance is what is preventing us from “letting-go”. The “groan zone” is the phase just before. It is not willing to let go of our patterns, dynamics, habits, images, beliefs. It is not willing to let go of control, let go of pride, let go of words, let go of exerting power over, let go in all possible ways. And there is such beauty in acknowledging this phase and in giving it enough space within the whole living process of Theory U. It is how we get to know each other and respect each other, by witnessing our struggles. A practice helpful at this moment is World Café. World Café is a New Space Technology. It is a simple process of bringing people together to talk about things that matter. The groups are anything between 15 and 100. You need a room set up with tables that are covered with paper and can each host an average of 5 people. People share their views around a burning question and switch tables in order to connect the threads from each table’s discussion. There is always a host at the table who makes sure the conversation stays focused around the burning question. My book Becoming What is Changing: Exposition describes World Café and compares it with several other New Space Technologies. Here in this expansion of our 4th Breath and the burning question in our World Café is about our experience of the “groan zone”: How can we discern and allow the “groan zone”? This practice can lead us out of the “groan zone” and into “letting-go”. Otto Scharmer defines this “letting-go” as a letting go of the ego of our old self. We do indeed let go of limited identification of our ego, we do not let go of our entire ego. Our ego is a major tool for our personal growth and allows us to tend to our State of Being. It is our inner conductor. Our ego is defined by how it identifies itself with a part or several parts of us. I invite us to identify our ego with much more of ourselves than this limited part of us. In its highest form, our ego has the capacity to sense into the field and allow magic to happen. A detail of the drawing of Dancing Theory U shows a literal letting go, a dissolving of the resistance in fragments. The red wave is fragmented. “Letting-go” of everything that does not serve us any longer. It feels as if you are going to die, you don’t know how you will move through this threshold, through this eye of the needle, you can only surrender. A participant shared in one of the trainings: “Embrace, recognize, take distance from fear. You have to live it!”. “Letting-go” is the removal, dissolving of the resistance and surrendering is the moving through the cleared field. This surrendering is our next moment of stasis. In the World Café you invite participants to reflect in silence on the patterns, themes and deeper questions experienced in the small group conversations. This is a stasis in deep connection with others, with the world, with the surrounding sphere. We are at the outer edge of the U, deep down in the U. We have reached a state of listening outside the world of our preconceived ideas and concepts. Our circle of attention widens and a whole field of possibilities opens, not just one new reality, many realities existing together. We feel we are connected to and operating from a widening surrounding sphere as Otto Scharmer describes it. Time is slowing down and space seems to open. Each individual reaches this “presencing” and so do we as a group. The group being connects to a source deep within. We achieve a deeper connectedness then we were able to do so far. 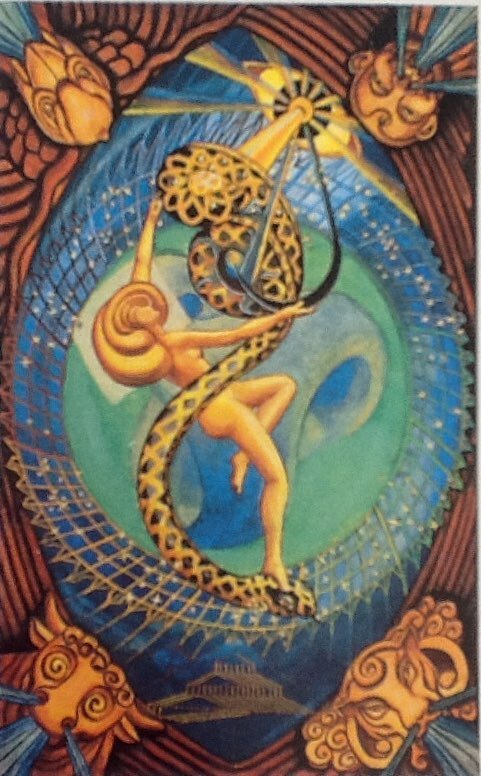 A deeper connection arises in this initial phase of “presencing” reaching towards the essence of who we are and what we bring in the world. We achieve a point of communion with the group. 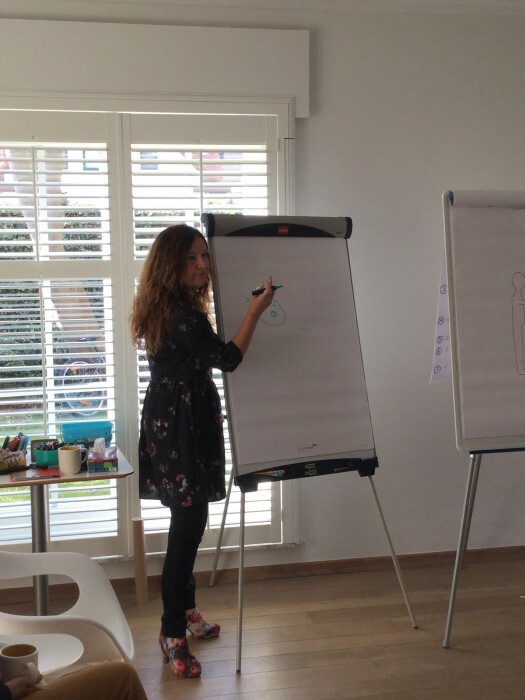 We return again as in our previous articles to the real experience of this 4th Breath in the Guest House Facilitation training in Berlin, in November 2014. In our training the opening of our State of Being will at the back of our energy field, started at the end of the day with the preparation of our dinner, the eating of our dinner and our night’s sleep. The activities of daily life are a part of the training and have a space in the experience of the Life Pulse. We are not served our food, we prepare it together and we serve each other. The idea behind this is to offer participants a more in depth experience of Theory U, of the Life Pulse, of the principles of Guest House Facilitation and an ability to take all of this back home with them. As a host I experienced something really profound in this training. The teaching at the start of the expansion within this 4th breath was very difficult, the transmission of the knowledge was awkward and only after the completion of this breath it dawned on me that “of course” you cannot teach anything in the “groan zone”. There is too much confusion and resistance within the participants. This 4th Breath is most of all the “groan zone” breath. The key feature of this Breath is the awareness of this fascinating triad “witnessing, asking, experiencing”, enabling us to pause and to be with what’s here now. On our journey through Theory U, at the bottom of the U, lies an inner gate that requires a huge “letting-go”. Literally and metaphorically you need to become empty in order to be able to pass this inner gate. This inner gate makes it clear that even if you move through the U with a group and even if the group being assists us to move through the journey, it’s an individual act of letting go of everything that is not essential. It is an individual act of opening our reason (=mind), our emotion (=heart) and our will. It’s up to you do decide if you are ready to let go of how you know things are, should be, have to be into this fascinating field of emerging possibilities of how things could become. This is new territory, unfamiliar in our society in many ways, yet powerful and fulfilling and needed in order for us to thrive on the waves of changing consciousness and their effects in our world. Awareness of the Life Pulse is a wonderful tool to assist us to move through the “groan zone”, to allow the “letting-go” and the subsequent surfacing of the spaciousness of “presencing”. From this deep connection to Source, to our soul’s purpose, and with all of us, we are ready to embark on the 5th Breath. This 5th Breath is primarily a residing in “presencing”, in the spaciousness. The key question is if tapping into this real force of “presencing” can bring the new into reality. You can discover this in our next article. Please, if you like this article share it with your friends and colleagues. Any comments or stories are welcome.